Some of you will know I sadly lost a very special friend and Godmother to Ben at the end of August. I made this page straight after her funeral. She was a fun loving, strong lady who loved her family and friends and would do anything for anyone. We are going to miss her tremendously. The page started as a 'mop up' piece used on the first page of the book (see here). 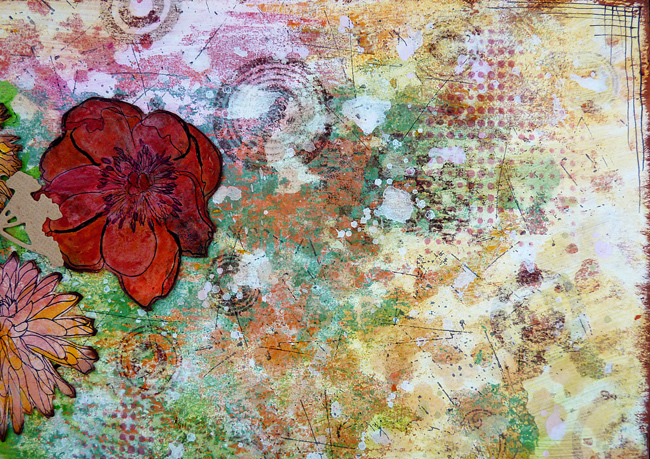 I had used it for mono-printing and drying off using my trusty media fluid acrylics from DecoArt.. 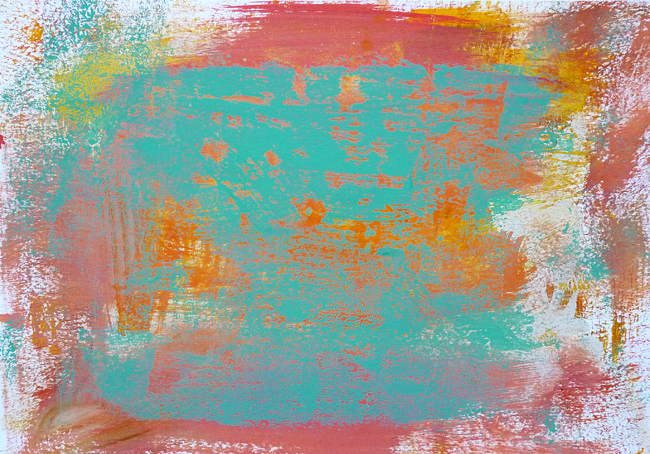 It looked very different by the time it had gone through a series of stamped, painty and stencilled layers. 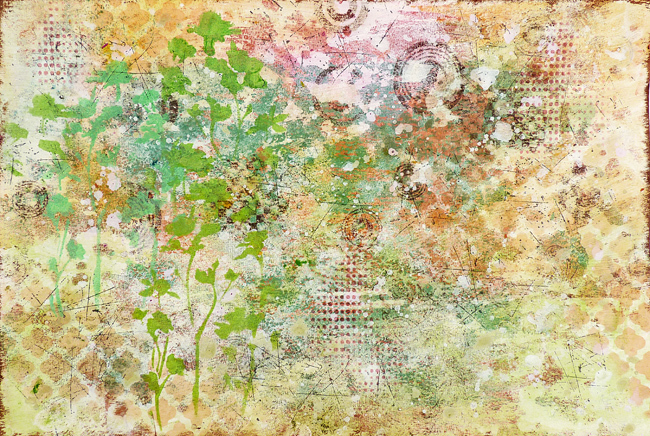 My friend Linda loved her garden so I decided flowers would be my remembrance piece for her, I used Tim Holtz flower garden stamps, his wildflowers stencil and wildflowers die to create the effects. 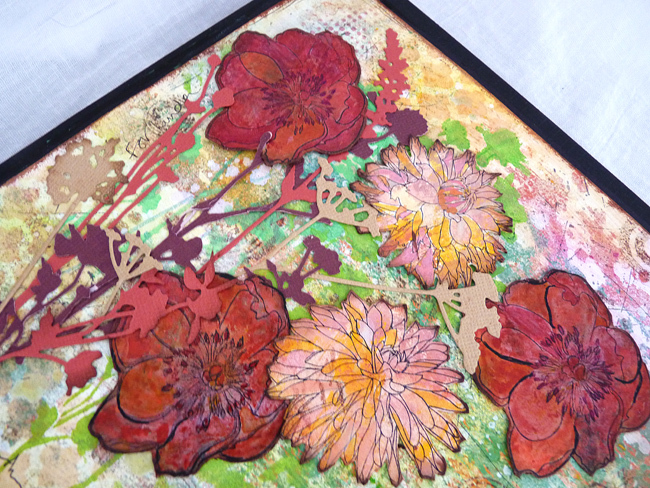 The stamped flowers were cut and individually painted using media fluid acrylics. And the page is in my Seth Apter style journal. 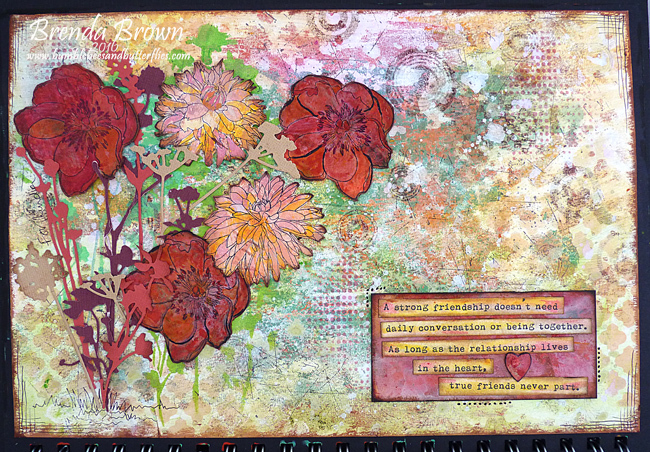 I would like to enter this into the Anything But Cute 'Friendship' challenge as it was partly inspired by being a Guest Designer for this current theme, but this is a very different style than the vintage clipboard I made for it. You can see that here if you missed it. A moving tribute page Brenda! A wonderful tribute to your friend! A beautiful page Brenda! It's always so sad to lose a friend but this is the perfect way to remember her, she would be honoured. what a beautiful page to remember your friend. love it. What a wonderful way to honor and pay tribute to your friend/ Beautiful! A really gorgeous tribute to your friend. Hope making art relieved a little bit your pain, Brenda. What a beautiful post and a beautiful project. I'm sorry for your loss, and I think this tribute is fabulous. LOVE the flowers and color and texture. Wonderful tribute to your friend. And the transformation from the beginning colors to the end result is awesome sauce and so very different. 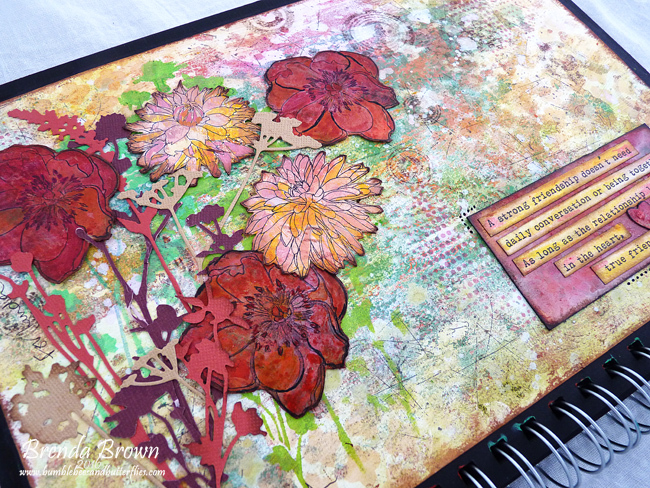 Fantabulous use of so many stencils, stamps and textures! Wowzers! A beautiful page Brenda, and a beautiful quote. 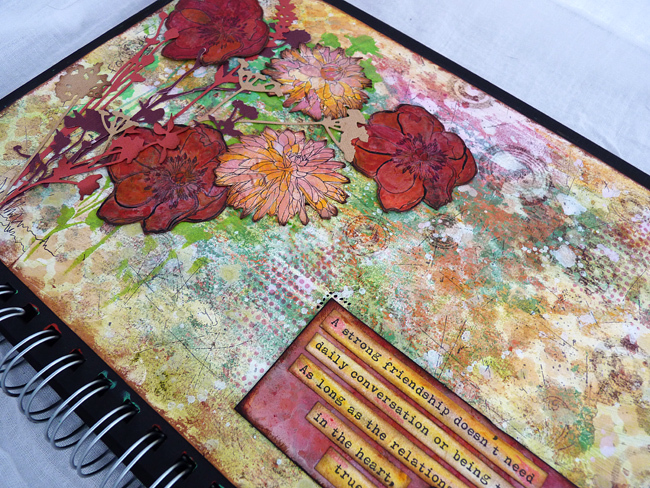 A lovely tribute to your friend and no doubt you will think of her every time you use your journal. Gorgeous!Love those flowers and all that yummy colour! Eine wundervolle Karte mit ernstem Hintergrund. Sehr schön gearbeitet, liebe Brenda. Oh, dear, Brenda! I'm a little late visiting, but so happy I did! Your tribute to your friend is so lovely! I love the quote and your background is amazing! 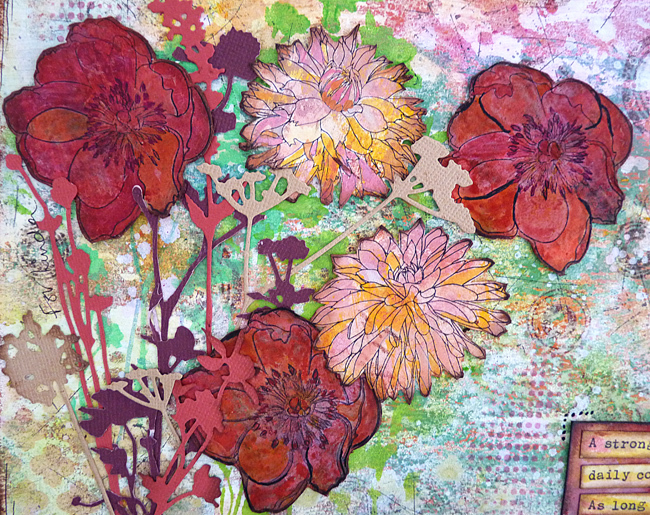 The flowers are colored so beautifully and paired with the die cuts look like a real garden. Perfect touch to add the doodling and sweet to scribe her name...Love this! So terribly sorry for your loss of such a wonderful friend. Hugs! 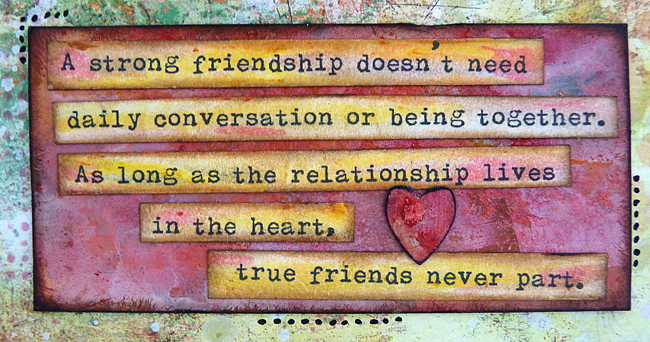 PS Thank you for including this in our Friendship challenge at Anything But Cute! It's perfect!